The Amazon Kindle Fire is the perfect device to use to show off your photos. You’ll have to get your beloved photos over to the device first though. You can transfer pictures from PC to Kindle Fire using these steps. Connect the device to your computer using a USB cable. Since it doesn’t come with one, you will need to either purchase one or use one you may have from another device like your smartphone. Once the Kindle Fire is connected to your computer. If not, disconnect the cable and try again (I had to try 3 times before it worked). Windows users should know that the OS will attempt to install a device driver and fail. This is fine and shouldn’t have an effect on performing these steps. The Kindle Fire will now show up as a removable disk drive. Windows users can look under “Computer“/”My Computer”. Mac users can look on the desktop. Open the “KINDLE” drive. You will see a folder named “Pictures“. You can drag and drop any of your pictures to this folder. 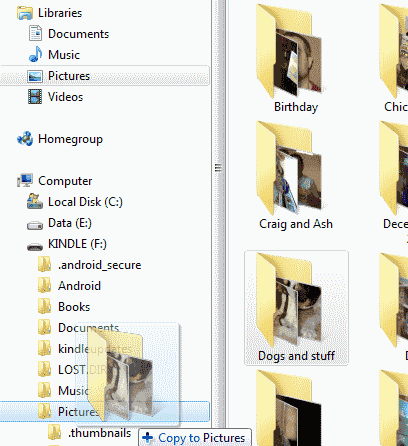 You can even drag entire folders to the “Pictures” folder and they will stay organized on the device as well. Wait for all pictures to transfer from the PC to the Kindle Fire. Once it’s completed, tap “Disconnect” on the device to unmount the it from the computer, then disconnect the cable. 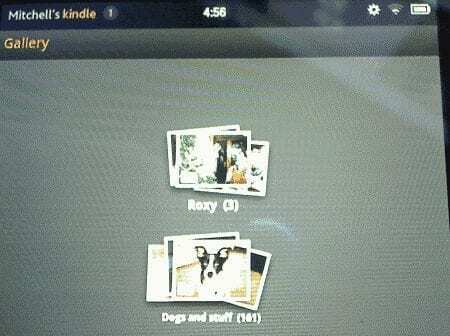 You can now go to “Apps” > “Gallery” on the Kindle Fire to view your photos. This may not be the exact place to put this info, but better posted than silent. Lots of posts about how to transfer .jpg from Win7 to Kindle Fire. Win7 originally would not recognize Kindle Fire USB connection. After I found and installed, “AmazonDriveSetup.exe” , file transfer was a snap. I’ve done these steps and found the picture folder was empty, even though I checked again and there are 300 pictures on my Kindle.What am I missing? I open the kindle file. I get internal storage. I click on that and get a bunch of folders. One is pictures. I click on that. I get facebook or twitter. 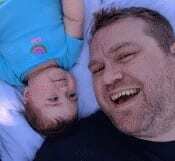 I want to transfer a photo from my laptop to kindle fire hdx PHOTOS, not facebook nor twitter. Very helpful..all the other articles I have read made the process v ery daunting ! Thanks for this. A helping hand! When I open my Kindle Plus, and have a USB cable attached, I do not find a Pictures directory on the Kindle. I have looked in the folders that were there but nothing. I am certain that I running the current software for Kindle. My PC is running Windows 7, 64 bit. Can you help me? Ditto the previous comments. This made it soooo easy. Thanks a million!! !